A loud explosion was heard around the Somali capital, Mogadishu on Sunday morning which followed by heavy gunfire, a witness said. 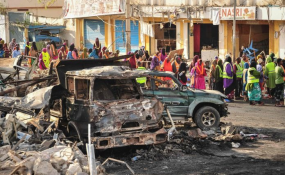 The initial reports suggest that a car bomb was detonated at the administrative Headquarters of Howlwadag district with reports that armed gunmen are inside. It was not immediately clear the exact casualty figures of the explosion as the attack is still ongoing. This is a developing story, more to come soon.